50% off crocs - treat your feet this season! 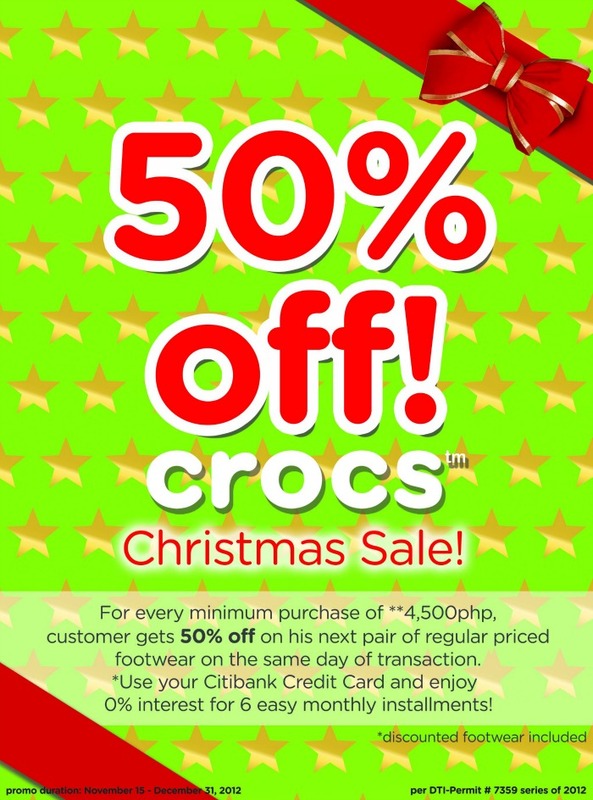 Crocs is at it again, this time with a month-long Christmas sale. Visit any Crocs concept store nationwide until December 31, and for a minimum purchase of P4,500, you can get your next regular-priced pair at half the price. The complete Fall/Holiday ’12 collection is now available in all Crocs stores. The designs range from wedges, ballet flats, slip-ons, and sandals for women; boat shoes, sneakers, and leather slip-ons for men; while the kids can go playful in the classic clogs, sneakers, and cute sandals. What’s more? Enjoy 0% interest for a 6-month installment when you use your Citibank credit card. This promo also applies to all existing discounted footwear. So head down to the Crocs store near you and get a pair of trusty, comfy shoes for your loved ones this Christmas.